Sometimes, when talent is abundant, it’s hard to pick a clear winner on reality singing shows. It seems every one of the final contestants deserves their place on that stage. 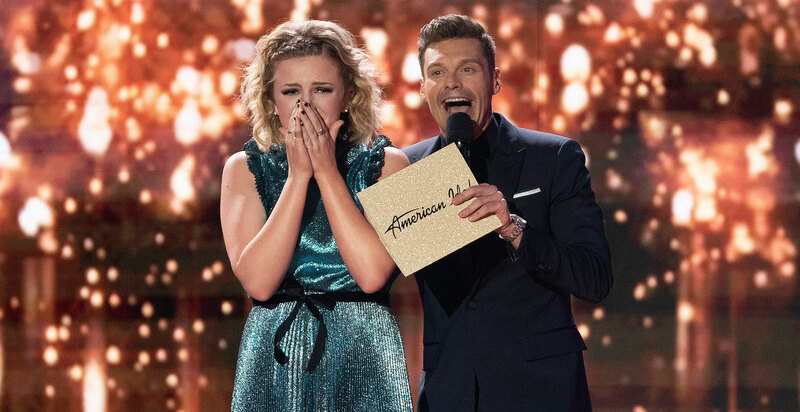 That’s why it was so great that there was no real loser on the season finale of American Idol last night, when, in a moment that couldn’t have been scripted better, the top two contestants revealed they’ve secretly been dating since nearly the start of the show. He also impressed ET’s Lauren Zima by remembering the very day he met Poppe, Jan. 21. “The first day of Hollywood week and we haven’t really spent any time apart since then,” he said. For her part, Poppe seemed understandably overwhelmed by all the emotions of the evening. “I’m just so happy, so on top of the world that I can’t even believe this is my life, so it’s pretty amazing,” she said. She admitted that the couple didn’t have a plan for what would happen if they faced off in the finals. “We thought, well if we get to the final two — I guess we were just kind of playing it by ear,” she told ET. Regardless, the story has a happy ending for everyone. Hutchinson said he has no hard feelings over losing to Poppe. “When I looked over at Maddie, I was like, ‘I win either way.’ I really do. I don’t feel any type of bitter or loss at all. I’m just so happy for her.” Aww, you’re a good man, Caleb! Sometimes dreams really do come true. Congrats to Poppe and best wishes to the happy couple on their made-for-TV romance.